This self-proclaimed “vampire story” by Irish playwright Conor McPherson is intended for mature audiences – and not primarily because it’s frothing with filthy language, including a couple words not heard often on the Alley stage. No, the play is intended for mature audiences because it takes God’s own time getting around to what it seems to be promising, and then feels no moral compulsion to actually deliver it. An audience has to be extremely mature to put up with that. If anything, it may be the packaging of St. Nicholas that seems odd. The Summer Chills series at the Alley tends to be like summer reading – you know, those books you take to the beach. They may be dark and scary but always in a melodramatic, entertaining, wildly diverting sort of way. Most Chills are fast-paced like that, and many carry the lighthearted stamp of either recent wit or century-old seriousness now reduced to camp. Playing in the (much larger) Hubbard Theater while St. Nicholas plays the Neuhaus, Agatha Christie’s whodunit The Mousetrap is, by contrast, the perfect Summer Chill. As delivered as a tour de force, two-act monologue by company member James Black, St. Nicholas has a ton of things to admire – even if it seems to fail the most basic tests of Summer Chilldom. 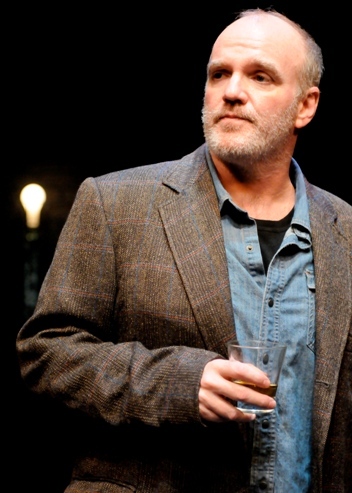 It is a remarkable opportunity for a remarkable actor to command the stage, sharing focus with only a stuffed chair and a table holding an often-used whiskey bottle. The entire narration is addressed to the audience, though no adequate reason is given for being so: a troubled man speaking to his therapist, for example, or a man on Death Row giving his final confession. This unnamed Man simply talks because it’s what he does, occasionally touching on the subject that brought most people in through the doors. Vampires. Vampires are hot stuff now, of course – a fact that may or may not have prompted the Alley’s programming decision. Certainly this show is nothing like True Blood on HBO or the Twilight stories in book or movie form. Despite the play’s claims that real vampires are ultimately more horrific than their fake Hollywood counterparts, it’s doubtful most people found these frightening at all. And the fact that their bite takes such a small toll – no, the victim doesn’t become a vampire but simply remembers having a nice time – has a tendency to undermine any and all chance of suspense. Still, it’s the sheer talkiness that undermines most. Black is extraordinary climbing up and sliding down hills of colorful images (as with most Irish writers), but what that English guy once said about “sound and fury” has to cross your mind once or twice. Extended dark lashings of theater critics, for instance, are well-put and sometimes richly deserved, but ultimately come off as far too “inside baseball.” More universal are the narrator’s twisted, embittered takes on love, life, family and just about anything else he mentions. And mentions. And mentions. Yet if some aspect of vampirism is intended to be a metaphor for something larger, less fanciful, I for one closed out the evening not getting it. A tip of the hat goes to Black for never letting us get bored. Partly, of course, we’re waiting for a thrill that never comes – the moment Van Helsing rips away the curtain to let the sun burn in and pounds that stake through the screaming vampire’s undead heart. But partly we’re fascinated by the seemingly unedited revelations of one very troubled mind. There are many chills during this dark and solitary journey we make with Black – they’re just not the summer kind. Photo by Jann Whaley: James Black in St. Nicholas, at the Alley through Aug. 8. Way back in 1952, a number of noteworthy things happened, I’m sure – only one of them the London opening of a clever little mystery play by Agatha Christie called The Mousetrap. Oddly, unthinkably almost, that play is still drawing enough of an audience each night to keep running. It’s a London tourist attraction by now, a must-see theatrical equivalent of Big Ben or Westminster Abbey. It’s entertaining what’s probably its third generation of Londoners, who consider it as much as part of their lives as the fog drifting in off the Thames. And now, thanks to the Alley’s always-welcome Summer Chills series, The Mousetrap has arrived in not-so-chilly Houston. 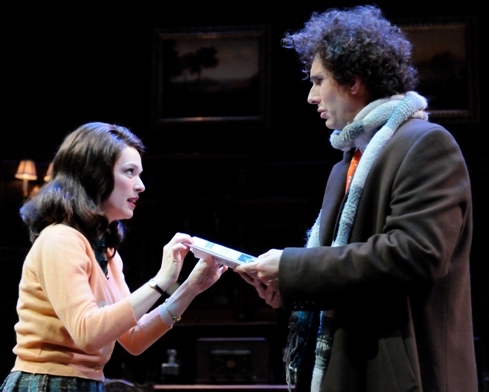 During the curtain call, one of its actors encourages audience members to tell their friends how good the play is – but not to reveal the ending. That’s been a Mousetrap tradition from the start. And based on the laughter and attention of the Alley’s opening-night audience, it seems to be working. The Mousetrap, you see, is vintage Agatha Christie, in every sense of the word. Except for the absence of her famed, quirky-as-hell Belgian detective Hercule Poirot, the plot has everything we might wish for from her: many quirky characters, many possible motives for murder, many carefully measured-out bits of revelation, many “red herrings” to lead our suspicions astray. The story is, like most of her best plays and novels, unflinchingly dark in content. Yet (especially at the Alley, and especially during Summer Chills), twists are delivered with an entertainingly deft hand and more than a little camp. This is truly an ensemble piece, and the company gives us an ensemble worthy of the word – lots of quick, witty and skipping-about dialogue, with stage movements that do much the same. Characters, in other words, seem to sit down only to stand up again, and arrive only to leave, preferably by a series of intricately described doors, staircases and back passageways. The Mousetrap goes to great lengths to set up possible entrances and exits, making the act of playwriting and the act of cold-blooded murder seem quite similar. 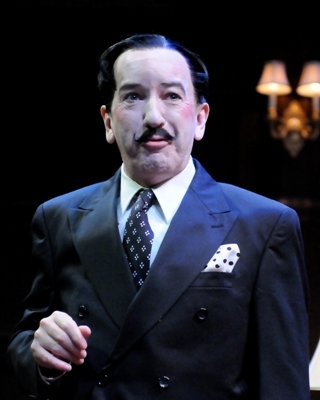 Being without Poirot to entertain us, we bond quickly with the quirkiest performances onstage: in this case, Todd Waite as Christopher Wren, a deliciously foppish young man with a wild head of curly hair and a penchant for very colorful socks, and John Tyson as the self-described “unexpected guest,” the Italian Paravicini. His face almost clown-white with too much makeup, his jet-black hair slicked back, his dark suit folding perfectly as he flits and flows through the play’s single set, Tyson is a delight. For seekers of Christie Quirk, all other characters pale a bit by comparison. But then again, there’s that whole whodunit thing to worry about, along with who will almost certainly do it again. Elizabeth Bunch and Chris Hutchison are convincing as the young couple who’ve just opened the Monkswell Manor guest house that gets snowed in on Day One, as are James Belcher as the huffing-and-puffingly British Major Metcalf, Anne Quackenbush as the ever-judgmental Mrs. Boyle (a classic of British storytelling and presumably British life), and Josie de Guzman as the mannish Miss Casewell, the perfect gender foil for Waite’s over-the-top Wren. Jeffrey Bean deserves some extra credit for his Detective Sergeant Trotter – but then again, the formidable ghost of Agatha Christie forbids us to tell you any more that that. After all, if past is prelude, the Alley may want The Mousetrap to run until at least 2068. Photos by Jann Whaley: (top) Elizabeth Bunch and Todd Waite, (bottom) John Tyson, in Agatha Christie’s The Mousetrap.